Every once in a while, an interesting device appears that we already know most people will never hear about. That's the case with this new Meizu phone called the MX3. The Chinese manufacturer isn't very known outside China, but over there is starting to draw more and more attention, we already know that the Meizu M9 was a big hit in 2011 and that it made the world outside China to get to know that the company exists. 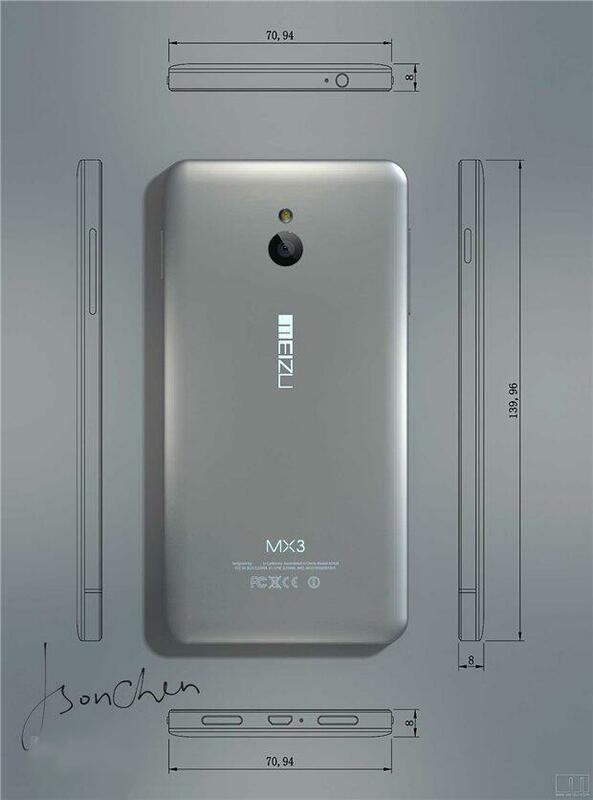 Two images of the upcoming Meizu MX3 have leaked, courtesy of @srcleaks showing the front and back of the device, along with the specs. As you can see, the design is an evolution of the MX line from Meizu with the circle Home key on the bottom. If you ask me, the MX phones have always looked too much like an iPhone, and I never liked them, Meizu is too obvious when it comes to the look of these phones, with the single circular button on the bottom and the amount of curve of the corners of the device. Some people may like that, but for me, it's too unoriginal to be attractive, even if the industrial design is solid and the materials are good. Internally, the MX3 is a very solid device, with an Exynos 5 Octa-core processor and 2 GB of RAM, just like the Samsung Galaxy S IV, and a 5.1 inch display with 1080 x 1920 resolution. The camera is also great, at least in the numbers, with a 13 megapixel rear camera, of course, that tells us nothing until we see some samples and performance in the real world, we already established that megapixel count means almost nothing these days and that the sensor is what's important. All of this is completed running Android 4.2 Jelly Bean covered with Meizu's skin called Flyme 3.0, which again, has an iOS vibe to it. The device measures 139.9 x 70.9 x 8mm so it's not exactly a small device, but it's not huge either, specially considering the size of the screen, overall is a tad bigger than Samsung's flagship. As usual, we don't know where this device will be available, everywhere outside of China is up in the air, the MX2 launched in China, Hong-Kong and Russia, but who knows what could happen with the MX3. Maybe Meizu is trying to expand itself to the rest of the world, but we do know that U.S. carriers don't go for these type of phones, so you might be able to get it unlocked in places like Amazon, that is, if you care about a phone like this.